I think we agree that a unit that is perfectly still will over time get different readings for its position. There is a certain amount of imprecision in calculation of GPS location. What I am saying is that this inprecision changes not only the bearing and distance to the cache but also the heading of the user. GPS and smartphones are not very good at determining the heading (or direction the user is facing). Some have electronic compasses that measure the magenitic field the earth to determine which way the user is facing. Others determing the heading of the user by which way he is moving. (The assumption being that you move forward). When standing still or moving forward at a slow speed, the imprecision in computing position can be interpreted as movement and effect the heading the unit uses. 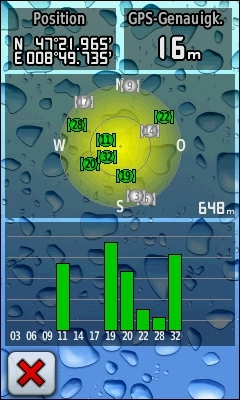 The compass screen on the GPS shows the heading at the top and the arrow points to the relative bearing to the cache. A slow moving cacher can have the heading change and the arrow moves as the relative bearing changes. You can set the data fields on the screen to bearing and distance and watch the arrow spin around while the bearing and distance show only minor changes. This occurs no matter the distance to cache. You may not have experienced this if you have an electronic compass on your unit and you calibrate it regularly. But believe me it is real for users with units that don't have electronic compasses or who turn off the compass to save batteries. Some may learn not to follow the arrow when their forward speed falls below a couples of miles per hour (normal walking speed). Others will blindly follow the arrow. These people would probably find the map page or data readout more useful. Good points from toz about the heading being related to movement. Hadn't even considered that hurdle when using the compass view (mainly because I rarely if ever look at the distance/bearing for navigation, and every phone I've had since 3GS has a magnetometer). the 'problem' arises because, regardless of what screen you use, at any given time your GPSr does not know precisely where you are. Your estimated position is an ever changing datum, even if you are standing still. The waypoint you are navigating toward, on the other hand, does not change position. Because your position is constantly bouncing around, in all directions, relative to the waypoint, your direction and distance also constantly change, even if you are standing still. Of course. Again, it's not about what information is displayed, it's the difference in how it's displayed. The compass view is a very narrow method for depicting the information, as opposed to the overhead map view which allows for a 'bigger picture'. When using the map view, you have a static location for the waypoint (in the bigger picture, you've now got a grounded piece of data to work from visually), and a distinction is made between your estimated location and where the device thinks you should head to reach the waypoint. Compass doesn't make that distinction. The compass directs entirely relative, whereas the map at least is partially absolute. Same accuracy, same information, same numbers. Depicted differently (the biggest factor essentially being the overview of the static ground) the device is able to provide a grounded (pun!) thus slightly more reliable interpretation of the data that it has. What I am saying is that this inprecision changes not only the bearing and distance to the cache but also the heading of the user. Exactly. What I am stressing is that the heading of the user is affected, regardless of which screen you display. We're back to pie graphs versus bar graphs. it's not about what information is displayed, it's the difference in how it's displayed. The compass view is a very narrow method for depicting the information, as opposed to the overhead map view which allows for a 'bigger picture'. I think reliability is in the eye of the beGPSr-holder. When the topic is one of data interpretation, what works well for you, (looking at a map where your estimated position is bouncing around inside a floating circle, moving toward a target), won't necessarily work well for another. Your method is 'reliable' for you, in that you get consistent results. Such a method would be less 'reliable' for me, since my results would be less consistent, given that it is not a method I am used to. I think you nailed it long ago with your assessment of preferences. And I'm not quite why this offshoot on topic of reliability of map vs compass was so lengthy. On my part, I always said "I find map more reliable" and explained why. I think we just had to clarify, between us, what 'reliable' meant in the context of presentation of data. It certainly is preference. I'd much prefer pulling on a rope that's tied to a boat that's rescuing me from churning waters, than attempting to locate a lost kite in a corn field by following a fluttering flag in my hand . . .
My personal preferences is to have a guide to point out the direction where I should go. To stand with me as the churning waters begin to rise and point the way to higher land . . . okay, that analogy probably is not the best, but that is essentially how I use the device. When I did not feel my smartphone was reliable enough to do that, I rarely used it for caching. When I did I looked at the boat's location instead of anything else and worked my way to that spot. It was fine in limited situations. I did not have a dnf with it. But I wanted a device that pointed me where I needed to go so I would not have to figure out where I am. I was never very good at being here now, but I know where I am going and the direction to get there, I can usually make my way. Now my current iphone points just fine. In some cases better than my handheld. So I use that most of the time because it is convenient. If it weren't, I would be using my handheld more often (to return to the topic at hand). But any method that can get you to where you need to be is a good one for you. Some of us are just trying to underdstand how you can say one view is more reliable than another using "same accuracy, same information, smae numbers". To be fair, it's your perception of reliablity that you're advocating. You see a changing direction pointer & distance as less reliable. I see a moving "grounded point" reletive to me as just as unreliable. When I watch a waypoint move around me on the map screen (the unit always has my estimated position in the center) I don't get a feeling of reliablity, any more than watching a direction/distance indicator changing. When I'm approaching a waypoint (walking, driving, or riding a bike), I like the hard numbers for estimating how far to go, than menatlly estimating the distance on a map with a variable scale: "Oh, I'm almost on top of the cache icon! Oops, no, it's still a few hundred feet, the scale was at .2 miles." At 0.2 mile scale, the icons almost merge, at 200 foot scale it's a little easier (but still how far is that on a 2" screen? ), at 20 foot scale I can't see the icon unless I'm standing on it. If your not following an arrow you don't even care about heading. The heading issue is unique to someone using the compass screen and following the arrow to the cache. 1. Map page - you see a map with the location of the cache and your position marked. If you're good a reading maps you might have some idea of what direction you need to walk to get to the cache. If you're not very good at reading maps and don't have an idea of which way north is, you could start walking and see if the track drawn on the map is going toward the cache. If it's taking you away, you can turn around and walk the other direction. 2. Data display - you see some numbers, let's just say you see bearing and distance. If you have some idea of where north is, you can estimate the bearing and start walking that direction. If the distance goes down you're getting closer. If it goes up, turn around and go the other way. 3. Compass display - go in the direction the arrow is pointing. You don't need to be able to read maps or know where north is. But the compass has a weakness on some units that don't have an electronic compass built in. These units determine your heading based on your motion (or perceived motion). You can be 100 ft. from the cache, if you are standing still or moving slowly the arrow in pretty useless. It is wrong to say there is no difference between the views. It is also wrong to say that "inaccuracies" are the same. True, the unit doesn't care what view you are in when it calculates your position. Your position will fluctuate the same no matter what view is displayed. But depending on the view, the fluctuations may or may not be as noticeable, or make as much difference in how you interpret what you see. You will almost certainly take a different route to the cache depending on which view you are using. That is why different people have indicated they prefer different views at different times in course of a cache hunt. It is not only a matter of personal preference but also because the information is presented in a way that is more useful depending on the where you are in the hunt. P.S. I just noticed your remark on pie graphs vs. bar charts. I happen to think I have some expertise on this topic because of the project I am currently working on. We've done some research of scholarly studies of how to present data as well as talking to our user base to get input on their preferences. Some of the scholarly papers point out that pie chart are usually a terrible way to present data. You lose some information that can be shown in a bar graph. Also people seem to have a difficult time estimating areas of pie wedges. If you have two wedges that are similar size, a user can't tell them apart but they can tell which of two similarly sized bars is bigger. Second, from our users, we find that they want to view the same data various ways. Due to the nature of the data the can see certain features better in a line graph and other features better in polar coordinates. They often want to display the same data both with a linear scale and a logarithmic scale. We are finding out that is not just the users preference, but the particular features of the data they are interested in that determines which graph or graphs they will display. Some of us are just trying to underdstand how you can say one view is more reliable than another using "same accuracy, same information, smae numbers". To be fair, it's your perception of reliablity that you're advocating. You see a changing direction pointer & distance as less reliable. I see a moving "grounded point" reletive to me as just as unreliable. When I watch a waypoint move around me on the map screen (the unit always has my estimated position in the center) I don't get a feeling of reliablity, any more than watching a direction/distance indicator changing. See, that's where our uses differ. (also, what I described was not a point that's grounded and moving) I don't keep me in the center; it's jarring to constantly see the entire ground map shifting (not rotating, because I keep auto-rotate off). So yes, that is a preference, but it keeps the map static, or as static as I let it be as I move it and zoom it to my heart's content. I don't look at numbers (generally - distance usually, but not bearing because I find any digital compass effectively unreliable, or rather unnecessary, for me). And really, it's not like the current location 'dot' is jumping all over the place. When the map is still, and I see precisely where the waypoint is on the map as well as my location (for which, unless I'm 'within the zone', absolute precision is irrelevant and minor inaccuracy is imperceptible), that, to me, is far more reliable display of information than a needle waving due to by both my location's minor inaccuracies and varying calculated estimates. At the very least, in my experience I tend to find that the center point of a bubble displayed as the best location estimate is visually more reliable to me than numeric ranges that alter and shift around every second. Well the map view is far more reliable, in my experience. I prefer a visualization of the numbers overlaid on a map, by which I have more control and a wider perception of the task ahead of me. * that bearing range is calculated by basically taking your current reading's accuracy, and telling you the range in bearing/angle toward the target waypoint from one edge of the 'bubble' to the other (trigonometriez! ); so not only is the distance and bearing reliant on your location's estimated centerpoint, but also the estimated (in)accuracy of your gps location. Some people are more comfortable just reading their own map. What spawned all this was my curious inquiry to explore if there was any correlation between the number of people who have bad "smartphone" experiences (whether switching or returning to a dedicated handheld) and those who use a "smartphone" navigating in compass view. I think from now on whenever someone criticizes caching with a smartphone, I'll ask if they navigate to their caches by compass or map. Excellent point. We'd been caching for a few weeks and I was guilty of that, saying "it's 7.82 m away" - my wife said "that'll be it hanging in that tree [probably only 4m away...]"
When I've explained the hobby to people, more than once the reaction has been "so the GPS takes you right there - what's the fun in that?" - so as expressed in different ways on here, the "get within 10m, put gadget away, start to use eyes and common sense" approach is surely part of the fun, if not most of it? If your not following an arrow you don't even care about heading. If your objective is to arrive at the selected waypoint, you will most certainly care about both bearing and heading. In a nutshell, a bearing is the direction from your location to a waypoint. A heading is the direction that you are actually traveling. In compass view, these two datum are displayed numerically. In map view, these two datum are displayed as a graphic. While it's true that you need not know the numeric value of either, if you want to start at Point A and arrive at Point B, you'll need to be aware of both. I don't need to know both my heading and the bearing to get to a destination. I only need to know the relative bearing. Think of it as an automotive GPS telling you when to "turn right". People choose the compass screen because the main feature on that screen is a arrow that points toward the cache (relative bearing). If you use the map screen or just a data screen, then you are correct you need to know both your heading and the bearing in order to decide which way to turn. I was wrong saying you don't care about heading; what I meant was you don't care about the heading the unit computes. While you can have the unit display your heading in some form on either the map screen or the data screen, I believe that most people using these screens (particularly the map screen) will determine their heading without using the unit's determination of heading. They may be good map readers and can figure out the direction they are heading by locating features from the map in the real world. They may carry a magnetic compass and use it to determine their heading. Or they may uses the track displayed on the map to see where they came from and use that to determine their heading. If you are good at determining your heading you don't have to rely on the the inconsistent reading that a GPS unit without an electronic compass, or with an uncalibrated electronic compass, will give for heading. Certainly, some people who use the compass screen can figure out the their heading other ways and realize when the arrow is not reliably pointing to the cache. But I would argue that the reason for using the compass screen is to follow the big arrow on the screen. In summary, GPS units are pretty good at determining position. Yes, there are limitations that result in positions moving around a little bit. GPS units are not as good at determining speed and heading. They do this by taking position measures and seeing how they change over time. The small errors in position can get magnified to big errors in speed and heading. Some units may use magnetometers and accelerometers to improve the accuracy of speed and heading computations. Depending on the screens you are using, speed and heading computations may not even be displayed. You can navigate to the destination using heading information you get from somewhere else (or by using data the unit displays that doesn't rely on GPS position). If your objective is to arrive at the selected waypoint, you will most certainly care about both bearing and heading. "Care about" or "pay attention to"? When I'm navigating by map, I don't see or care about the bearing/heading numbers at all. Sometimes the distance. No, I'm just looking at the relative position of my location to the waypoint that's anchored on the map. In map view, these two datum are displayed as a graphic. While it's true that you need not know the numeric value of either, if you want to start at Point A and arrive at Point B, you'll need to be aware of both. Point being, the map allows you to rely on your map-reading and visual instincts more than just numbers that flutter, as accurate or inaccurate as they may be at any time. It certainly is a matter of preference. But I suggest that the more someone uses (and gets better at using) the map view instead of compass, the more they'll prefer it. Just my suggestion and just my opinion. I changed over time. I used to be a compass screen person but now I use the map screen. Of course, the two data fields I use on the map screen are Distance and the Bearing Arrow, so it's pretty much the best of both worlds. I know how far I need to go, I know which direction I need to go, I know which direction is north, and I can see the topographic nature of the terrain. As I mentioned earlier, you don't need to know the numeric values, such as 128 degrees. But if you are here, and you wish to go there, the two things you will need to know is, which way is 'there', and which way are you going. These two datums, (known as bearing and heading), allow you to determine how to get there. If your destination is kinda to your south, and you are walking kinda east, you might not get where you are going. At some point, you'll need to turn right. If you don't know that you are moving thisaway, and that you should, instead, be going thataway, you'll have a very long journey. Maybe I'm a bit thick but why do I need the heading? If my app is in compass mode and points where I need to go (ie: the bearing) it doesn't matter what my heading is - I know from the compass which way I should be heading (I thought I'd use the same word in two different ways in this post just to make it even more confusing ). You heading is always the way you are moving, whether you have a number or a general direction (i.e.. towards the cache, away from the cache, crossway to the cache...). To get to the destination you have to change your heading until it matches the bearing. It can be as rough as: I'm going this way (heading) and I need to go that way to the cache (bearing). It must be a difference in units, as mine always show my position in the center of the map, so that "static point" you keep mentioning is 'moving' in relation to me. So standing still I can see that point moving as my estimated position on the map moves (no, it doesn't rotate, North up is my standard). I've seen the cache go from 40' north of me to 10 feet south of me, to 20 feet east in span of 20 seconds. So, seeing that, I can't say the map is more (or less) reliable than a compass pointer that points north, then south, then east. I've just been trying to understand why you claim the map is more reliable. I see the same data displayed in different ways is just as reliable or unreliable. Whether the compass pointer is changing direction or my displayed estimated position keeps shifting around, to me is the same. To me it is amount of change that's a factor in finding the cache - a few feet vs. 20-30 feet vs. 60+ feet - and either display shows that. the two things you will need to know is, which way is 'there', and which way are you going. These two datums, (known as bearing and heading), allow you to determine how to get there. OK. This is just you using the wrong terms and not understand how to navigate from here to there. There are two locations, yours and that of the caches. From these two "datums" as you call them, one determines the course from here to there. This process is the opposite of projecting a waypoint, which I assume you are familiar with. Given your position P and the cache position C, you compute the bearing B and the distance D from P to C. To get to C (in a straight line) you proceed to walk in the direction B for the distance D.
But rarely can you travel in a straight line. You will eventually veer off-course for one reason or the other. Of course, your GPS is continually computing a new position P' and from this possibly a new bearing B' and distance D'. Now if you use the map you may infer the bearing and distance from the picture on the map. To do this you have to have an idea of which way the map is oriented relative to the way you are facing. This is called your heading. As stated above most map users have ways to determine their heading. If you use the compass screen, your heading is shown by the compass and the bearing is shown by the arrow. To make things easy, the GPS or smartphone orients the compass so the top of the screen is your heading. The the bearing arrow is pointing toward the cache. While you are absolutely correct that the errors in position P are the same no matter what screen you use, you are wrong in saying that all the screens are equal. In particular, I have been trying to explain that the compass screen can display the wrong heading because the inaccuracies in computing P can be misread by the unit as travel in a different direction and therefore the compass in not oriented with your true heading at the top. The arrow no longer points toward the cache relative to the direction you are facing. Thinking about it now, simply displaying the data (P and C) is the same as the person who tries finding a cache by wandering around till the position readout matches the cache coordinates. It can be done, but I hope every one understands that it is is much less efficient than either the map or the compass screen. I think the other problem is that some people are more concerned with how to use the display when you get close to the cache and the error in P is nearly the same as the distance D. As many have said, the GPS or smartphone is not helpful in finding a geocache at that distance. Here is where you put away the GPS and start looking. All screens are equally bad at this point. Guh? Yes, yes they do. But we're talking about the fundamental differences between a compass view and a map display. The compass displays your distance, bearing and heading in numbers and relative arrows. The map, as I generally use it, shows none of those things (I've turned them off). I don't typically display my distance. I don't have a heading arrow. I don't have a compass display. I have only my location bubble, and a static waypoint, both displayed on the overview map. This different way of displaying the data (not even including distance/bearing) allows you to infer said missing data by visually analyzing the map. With the wider perspective of the overall area, I find this to be more reliable than looking at numbers as estimated relative pointers. Maybe some other people don't, for themselves, and that's fine. The compass doesn't show me where the waypoint is on the map. That is what I prefer to see, because to me, that is a more reliable method for me navigating to gz. It has nothing to do with heading and bearing. I figure that out myself. Heck I could turn that on and it might help, but I often find those numbers to be irrelevant because I've already inferred what I need to know from the map and my environment, and those numbers bouncing around merely add an unnecessary factor of doubt. It must be a difference in units, as mine always show my position in the center of the map, so that "static point" you keep mentioning is 'moving' in relation to me. Well, we probably do have different devices, but that's really irrelevant. It's more a matter of what your device's UI allows you to view. In my app I could turn on locking to keep my location in the center of the map if I wanted, but for precisely the reasons you describe it to be frustrating and unreliable, I don't. I hate locking the map to my location. That's effectively doing what the compass view does - make everything on the display relative to me. See if you can find a setting to unlock the map from your location. I don't know if that's possible on your device, but if it's a smartphone, it would depend on the app you're using - but I don't know of any (decent) navigational app that would not allow you to have free roaming of the map view. Maybe I'm a bit thick but why do I need the heading? Say, for argument's sake, you are standing at Point A, and the cache is at Point B. let us also say that, according to your GPSr compass screen, (or map screen, if you prefer), the cache is due west of you. If, at that point, you opt to hike due east, you might eventually get to the cache, but it might take you a lot longer than you intended. However, if you apply the given bearing to your heading, you'll likely get there faster. But we're talking about the fundamental differences between a compass view and a map display. The compass displays your distance, bearing and heading in numbers and relative arrows. The map, as I generally use it, shows none of those things. I would argue that your map screen, even with the data windows shut off, still displays all of those things, to a degree, though the format is graphic in nature, not numeric. You mentioned that you keep your map oriented with north up, i believe? Not that it matters, but with north locked up, it's easier to explain. If you are navigating to a waypoint, your map will show you, the waypoint, and a line betwixt the two. If that line points straight off to the right, it indicates a bearing in an easterly direction. If the lne points straight down, that indicates a a southern bearing. With experience, you could probably determine, fairly closely, the numeric value associated with that bearing, though it's not necessary. So, we've established that your map view shows your bearing. Back to the easterly bearing. You know, from looking at your map view, that you need to go east to get to the selected waypoint. So, you commence hiking. If your line betwixt your position and the selected waypoint stays pointing straight off to the east, your map screen has just displayed your heading. If the line betwixt the two changes its orientation on the screen, your map screen is again displaying your heading. But now, it's telling you that your heading is wrong. So, we've established that your map view shows your heading. Distance is a little harder. Obviously, the line betwixt your position and that of your selected waypoint is X pixels long. If you match your displayed heading to your displayed bearing, that line will grow steadily shorter, unless you zoom in. Unless you are intimately acquainted with the landmarks in your area, it might be rather challenging to translate the length of the line on your map screen into a numeric value, but it still shows the distance. Just not in a way which is very helpful. So, we've established that your map view shows your distance. I'm just returning them to Toz. He dropped them a few posts back. I apologize. I misread your previous post so I though you were confusing 'here' and 'there' with the 'direction from here to ther'e and and the 'direction where you are going'. Rereading it now, I'm not sure why I misread it. There are still difference between the screens in what they display and which values are emphasized. In addition the heading value computed by the unit can vary by a much greater amount than the other values, so that a display screen that depends on this computed heading may be much less accurate than other screens. The heading is determined either by an electronic compass or by comparing two measures of the units position take a small time apart. Electronic compass is not always accurate. The compass needs to be calibrated and in some units the compass only works when the unit is held flat. If the user is moving slowly, the accuracy of the position measurements used to compute heading can have a great effect on the heading computed. Each screen displays and emphasizes different data. 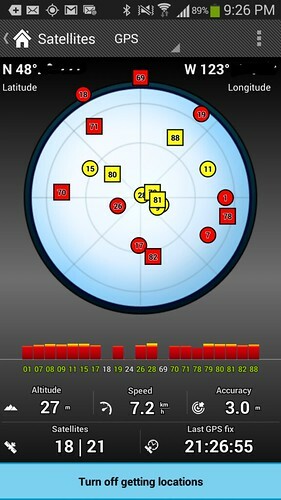 The compass screen emphasizes heading and bearing. If you hold your unit straight in front of you, north on the compass points north and your heading can be read at the top of the compass circle. The arrow shows your bearing. Many users find this screen useful because you simply follow the arrow. One does not need to know where one is (because you are there). One only needs to know which way to go and how far. Most people will display distance to the cache on the compass page. The map screen emphasizes where you are relative to the cache. While it might draw a line from your position to the cache to show bearing, unless you are good at reading a map that line isn't much help. I noticed today that my Oregon 450t shows my position as an arrowhead that is pointing per my heading. I could use this to turn the unit to match my heading and follow the line to the cache. I suspect I never paid attention to this, as I would generally determine my heading either using features I could see or from knowing the direction I had come from. The distance on the map is particularly hard to read. If you read the map scale you can make a rough estimate of the distance between you and the cache. If you use the display window you have the numbers for your bearing and distance and perhaps heading. But unless you have a fantastic sense of direction or know how to use a magnetic compass these numbers are not much help to find the cache. For most people following an arrow in the easiest way to navigate. If you rely on heading from a unit without an electronic compass or one where you didn't calibrate the compass, the compass screen can give bogus information. If you have decent map reading skills, the map may be better because you can ignore the heading displayed on the map (if any) and set your course based on features you see or by using some other method to determine your heading. With your permission Riff, I am going to use this from now on whenever I log a DNF. "I phlurbled when I should have twillis'd." I would argue that your map screen, even with the data windows shut off, still displays all of those things, to a degree, though the format is graphic in nature, not numeric. Dude, I don't know whether to agree with you or rant that you're still not getting it. Are you purposefully trolling? YES: The display is different, but "to a degree" in my case is "not at all". No, I would argue that bearing and heading are not even displayed graphically, in any way, on my map, not even a line. It's me, my map, and my waypoint. You seem to possibly be arguing that because my location bubble moves as I walk, the app is 'graphically' providing my bearing (or heading, whichever it is) simply because I'm able to infer my direction from the movement. That's where... I really don't know whether to agree with your not. Because my whole point is - that difference in display is precisely why I favour the map view over the compass view. It's not what is no longer being displayed that matters, it's how information I choose to display is presented. One view has no map. The other does. One displays numerical representations of estimated calculations and readings. One doesn't rely on that info display at all. One points you in a direction that is its 'best guess'. The other tells you exactly where you want to go, and lets you decide how to get there. I could go on. Again: The map is my preference (as it is many others, some who've posted here), and I believe that based on my own experiences between using compass and map view, others who make regular use of the map and get better at it, get used to it, will find it more a satisfying experience, especially on a smartphone, though then depending on which app (and UI) is used. That's just my belief, and my suggestion. It may not be true for most people, heck maybe no other person at all. But that's why it's just a suggestion, just a theory. No. It's inferred. Unless I turn on that data element. "My phlurble to twillis ratio was off again today for some reason. Maybe I should take my device in to get its blugglenibber checked." I use "show" to describe that it is displayed on your screen. I use "bearing" and "heading" to describe the direction you need to go, and the direction you are actually traveling, regardless of whether or not the display includes numeric values. In this context, both are displayed. Your map screen shows you here, and the waypoint there. With just those two data points, you can tell the direction to the waypoint, (your bearing), and which way you need to travel to get there, (your heading), though there are no numerics. It shows the cache is thataway. And you need to go thisaway. If you feel that a heading and bearing must include numerics, then you are right. Only that's not the case. The maps show a map with an indicator showing "You are here" and another indicator shows the cache is there. If the map displays north up, then you can estimate the direction from here to there relative to north (which we agree, I think, is the bearing). Now the average person will stare at the map and have no idea of how to get from here to there because they don't know their heading (which way they are facing relative to north). A compass screen shows a big arrow. With the screen oriented in front of the user, the compass rotates to the user's heading. The arrow points to the cache. The average person can follow the arrow. Back to the map. Someone like Clan Riffster or thebruce0 who is skilled in reading maps beyond the average person, looks at the map. They determine in some manner which way is north (maybe they have a compass, maybe they can identify features on the map in the real world and orient* themselves accordingly, maybe they see their track on the map and know it shows where they came from to get here). These people can use the estimated bearing from looking at where the cache is on the map relative to where they are and know which direction to go. A really good map reader can also look at the map scale and estimate the distance. Difference 1. Using the map page requires a modicum of map reading skills. Using the compass page requires the ability to hold a GPS in front of you and follow an arrow. Difference 2. GPS units aren't that good at computing heading - particularly if they do not have an electronic compass or if the compass needs calibration. The compass screen is affected by this more since it depends on the computed heading to orient the compass. The map screen is affected less since the heading is determined by the user's map reading skill. *To orient oneself originally meant to face east, so know your heading. Only that's not the case. The maps show a map with an indicator showing "You are here" and another indicator shows the cache is there. If the map displays north up, then you can estimate the direction from here to there relative to north (which we agree, I think, is the bearing). Yay! We've finally gotten you to admit the map shows the bearing! Are we talking about the average person? Heck, I thought we were talking about someone who owned a GPSr. They may not know the numeric. But if they've owned the GPSr for more than 5 seconds, they know they need to go 'thataway'. That is the display showing their heading. At this point, we should probably both walk away, before one of starts posting the "SOMEONE'S WRONG ON THE INTERNET!" meme. Continuing to post the same thing, back & forth, might be entertaining, but it is seldom productive. Map shows two positions. The user estimates the bearing by looking at the map. That's not the same as showing bearing. You could argue that a display showing your lat/long and the cache's lat/long is displaying the bearing because anyone could work out the math in their head and compute the bearing (or at least estimate it). I've actually seen this argued for UTM coordinates. And how pray tell do they know thataway? The compass page has an arrow that says go thataway. The map page requires map reading skills. The user of the map has to orient themselves (face east) then the can tell the right side of the map is in the direction they are facing. I didn't realize till yesterday, after owning GPSr's for over 13 years, that the map screen on my Oregon 450t does display my heading in that it shows my position as an arrowhead and that that arrowhead points in the direction of my heading. So I don't buy it that anyone who owns a GPSr for five seconds can find their heading. While many people have found the compass page and know enough to follow the arrow thataway, I'm not sure that people find the map as intuitive. Just learning you can display data fields on the map and can select what data to show is quite a lot to ask of some people. On my unit I've set the map to display the Active Geocache Dashboard which shows the name of the cache I am looking for, along with a small compass that shows my heading and the bearing to the cache, and the distance to the cache. I still find myself switching to the compass page because at my age I can't read the tiny compass in the dashboard. Each page has different advantages and provides different levels of navigational help. In addition each page is affected differently by the errors in computing your location. In some cases the effect is barely noticeable while in others you can have arrows pointing every which way but toward the cache. I'll grant that it is matter of preference which screen you use and that all will get you just as close to the cache. But there are tradeoffs between how much the unit does for you and what effect imprecision has on the display. Picking the display that works best for you is not a trivial flip of the coin. IMO, it is better to explain what is different between the displays than it is to claim they are all the same because they all get you to the cache. We are talking about DISPLAY. Not intuition. The compass and map views both DISPLAY certain elements of data in different ways, where the map view asks the user to INFER the rest. The map does not SHOW your bearing or heading unless you tell it to. If not, you INFER it from the data that IS displayed. Prefer the compass, or prefer the map. Probably so. I've gone back and looked at your position and we probably are in a agreement on this. I was not involved in the side discussion thebruce0 stated on which screen is used, till someone else questioned his comment that he found the compass page more reliable. That when I pointed out the different pages display different data (or use different ways to display data). The inaccuracy of position measurements effects the different displays in different ways and may almost unnoticeable in some screens while causing wildly varying display in another. I went on to give the example of how a unit without and electronic compass computes heading and why that can make the compass screen point to random directions. I think my mistake was in the way I responded to this. It is correct (depending of course on what you mean by precision). It does show that no matter the screen displayed the unit is continually computing your position and affecting the data displayed. I responded to this by trying to show that the small differences in position have a big influenced on the heading computed by a unit that doesn't have a magnetic compass. In order to see the "drunken bee dance" on the map you had to zoom all the way in. In order to see the effect on heading on the compass screen you simply have to slow down. The displays are affected by the inaccuracy in position measurement in different ways and depending on your speed and distance for the cache which one is better to use may not be purely a matter of preference. Later we got in a big discussion over heading. Again there is a difference in the displays. The compass screen clearly shows your heading by rotating the compass so north points north. That causes the bearing arrow to physically point toward the cache. The map screen might show heading (as my Oregon does) with a little arrowhead, or you might set your screen to rotate the map so your heading is up. But I suspect that many people using the map set North Up and ignore most of the hints on heading (the exception being the track, and when not zoomed in all the way, this provides a good indication of where you came from). What you call preference, I call tradeoffs. If you can rely on your map reading skill the map page lets you eliminate almost all the effect of position error on bearing and heading. If you don't have good map reading skills or prefer to just follow an arrow, the compass screen works by computing and displaying an arrow to follow, but that arrow may not be very useful when moving slowly on a unit without an electronic compass. I have Garmin Dakota 10. It will never plant itself directly over the coordinants. The device reads that it will be accurate from 25-5ft while I am walking up to the cache site. How does this compare to you cell phone users? Or even GPSers? I think that the Smartphone HAS already replaced a dedicated GPS unit for geocaching. I use a phone for work, not for play. I turn the darn thing off to get away from it some times. Or, you know, when someone has nothing more or better to say and their only remaining action is to be condescending in the name of humour , invoke the XKCD. This subtopic has now veered off topic, and I have nothing more to say on it. I think that the Smartphone HAS already replaced a dedicated GPS unit for geocaching. I don't use a phone of any kind for geocaching, I don't call and ask for hints to CO's like some of my friends do. I get emails asking for hints on my high D/T rated listings, and what I see around me are smartphone cachers. I'm still out in the field with a Garmin GPSMAP 60 geocaching and Waymarking. But the way I viewthis thread is the subject was important enough to end up at Groundspeak HQ and was posted here by one of the site Admin's, so yeah. This thread exists for a reason, and look at the price of the new Garmin GPS units. Not so pricey anymore. That tells me that they are losing the market of geocachers to smartphone sales. Garmin also is preloading their new units with 250,000 GC.com caches, so tell me again they are not tring to play catch-up with smartphones. Can you say Intro App? I hope this doesn't devolve into a debate over internet memes. Yes I keep wanting to make my point and it didn't help that in the middle of it I misread what you were saying about heading. My guess is once I admitted that, it wasn't worth trying to keep the discussion going. Beside that, you edited your post just at the same time I was writing my reply. So the first reply I made without seeing your challenge to walk away. I made another post this morning. Mostly it was meant to show we are not in total disagreement here. Yes the position computed by the GPSr has the same imprecision no matter which screen is displayed. Also, any screen can be used to navigate to the cache, so in a way this is a matter of preference. What I've been trying to explain is that the different screens, while all based on the same data, show it in different ways. They may display (or use in their display) different calculated or derived data. The effect of the imprecise position measurement does not translate in to the same amount of imprecision in these calculated data (that might not be intuitive). There is a tradeoff between what is calculated for you (so you don't have to figure it out on your own) and how reliable or precise that information is. So the question is, can they - not have they. Blogger, Geocacher - smartphone user, meets Hiker, Hunter, GPS user. Compare the above to this. Oregon 550t. It is picking up 6 out of 11 listed satellites. There is not even room for 18, let alone 21 on the screen. A dedicated GPS sure does have more reliability than smartphones. That's whats it is meant to do anyway, nothing else unlike smartphones which have an array of functions. Smartphones do offer flexibility so you do not have to bring your GPS all around all the time. But if you want exact geo data, a GPS should be the way to go. What about those of us who are a hiker, smartphone user, gps user, geocachers??? I don't hunt, and I don't blog. I find them equally as repulsive. A dedicated GPS sure does have more reliability than smartphones. I haven't found this to be true. My Oregon let me down many times. Specifically, sometimes when I updated the caches, it wouldn't work at all. I would drive out somewhere, planning to cache, only to have my GPS shut down immediately after turning it on. I had to go home, delete the offending .gpx file and re-copy. All I was doing was copying 1 file. I don't see what I could have done wrong. Clearly, it was a bug. Never had this problem with my phone. My phone has only let me down 1 time since I got it last summer. It suddenly refused to pick up *any* satellites and I was stuck in the middle of the forest with only my brain to get me back. Looking back, I suspect that it wasn't the phone's fault. Because it was raining, I had the phone in a plastic bag which, when in my pocket, made the phone think someone was touching the screen, so it changed a bunch of settings. Once I got home, I was able to restore things back to normal. I blame the user, not the phone. After the Yuma mega event I was out with some friends who are approaching 10,000 caches and have never had a GPS. All found using iPhone. So the answer is yes you can be very successful with a phone. The question as posed has a relatively simple answer, "Yes." It CAN replace a GPSr, but the debate seems to center around whether or not it should (or has) replace(d) a GPS unit. I'm of the mind that two tools are better than only one so I use both. I use my phone for spur of the moment caching, to look up ECs when in the field to answer the required questions, and when I'm not concerned about service and possible damage. I use my GPSr for trips planned in advance, in areas where damage to my phone is more likely, and where service is questionable (out in the boondocks). I keep both with me when I'm caching and use the one that I want to use at that time. Both have advantages and both have disadvantages and I personally don't care what other people use (exclusively or otherwise) as it has no bearing on my caching. To each their own. Precisely the scenarios I haven't dealt with yet, which is why I don't want to buy a GPSr. I don't go on trips for the sole purpose of geocaching and pretty much never even LOOK for a geocache in an area without 3G/4G service. Of course there are areas with spotty service, but I just make it work in those cases.